Located in the heart of Pittsburgh's Strip District Consumers Produce is the region's leader in the procurement and sale of fresh produce. Far from content to ride the never changing tides of the produce growing seasons, The Freshness Professionals constantly strive to improve our service to our customers and respond to their changing needs. That's why today you will find at our home on 21st Street: a fully climate controlled warehouse that is state-of-the-art, ripening rooms that are second to none, a high-tech tomato repacking line, a retail packaging line, and a growing product list that extends far from the traditional staples of our competition. Since Anthony Corso, Albert Cohen, and Fred Siger opened Consumers Produce in 1952 the company has been family oriented and family run. 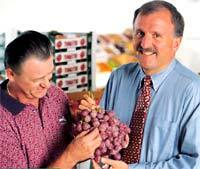 Fred's sons Jeff, Ken, and Alan, first worked in and then took control of Consumers. Alan on site as President, Jeff and Ken (until his death in 1998) as partners and decision makers in the constant growth of the company. But the family tradition at Consumers Produce goes far beyond the Siger family. At a time when nepotism clauses are commonplace in business, the Sigers have welcomed their employees' family members to become part of The Freshness Professionals. Whether you walk in the front door and are greeted by Barb Galasso (we call her Bausha) at the front desk, or come in through the loading dock and encounter a warehouse employee, you can't help but be struck by the friendliness of the people who work at Consumers Produce. It is a high-pressure business turning around a highly perishable product on a daily basis but the underlying feeling of the place is cordial but businesslike. Consumers Produce President Alan Siger says his philosophy is to "treat my employees, suppliers, and customers as I would want to be treated." It's a philosophy adopted by everyone who wears the Consumers Produce logo on their jacket or sweater (which are vital year round in a fully climate controlled warehouse where the temperature ranges from 32-to-55-degrees). At Consumers Produce we value 'family" above everything. You don't have to be around long to see that philosophy it in action. Many employers today shy away from, and even draft policies prohibiting, having family members working together. But The Freshness Professionals believe the strength of a family can increase the strength of a business and encourage family members of employees to apply when their talents match opportunities that become available. Indeed many of the employees are second and third generation produce workers. Among the Consumers staff today you will find brothers working along side sisters, sisters collaborating with sisters, cousins moving the daily shipments, fathers helping sons, and mothers sharing work time with daughters. That tradition also extends to Consumers Produce's relationship with growers, shippers, and customers, many of whom we have done business with for over four decades. Consumers Produce reaches out in many ways to the community in Southwestern Pennsylvania. Thousands of boxes of fruits and vegetables, as well as countless volunteer hours by the Consumers Produce family, are donated every year to Western Pennsylvania Charities. Whether it is walk-a-thons and races looking for something to refresh the troops, or the Greater Pittsburgh Community Food Bank helping to meet the needs of those less fortunate, Consumers Produce is there. When fruits and vegetables are not enough to meet the need the Sigers and Consumers Produce are generous in their financial contributions. Among the organizations that we support: The Race For The Cure (major sponsor), Family House, Little Sisters of the Poor, Vincentian Sisters, United Jewish Federation, and many other organizations in the Pittsburgh area. In addition Alan Siger is a proud member of the Alexis De Toqueville Society of the United Way. Copyright ©2001 Consumers Produce. All rights reserved.